“I’m upset! So offended that I had to double check.” Not actually, but I am blown away. 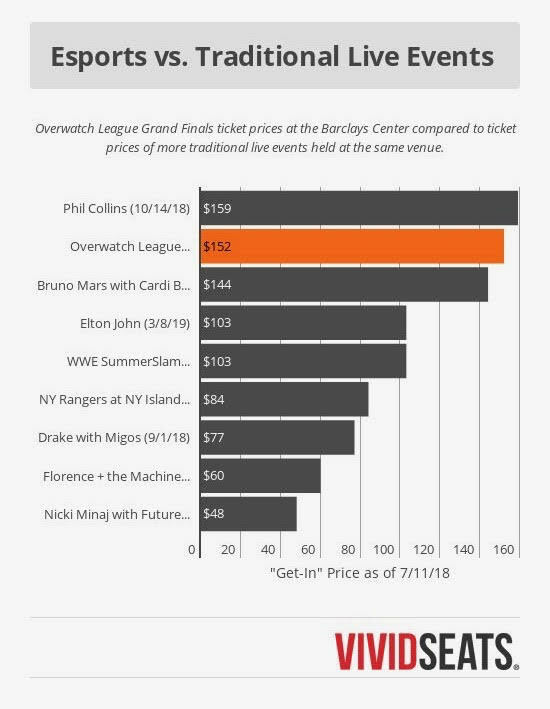 It costs more to watch Overwatch League than rapper, Drake, who is no stranger to video games himself, as you probably recall from his Fortnite stream with Ninja. Note: the ticket price data shows that the “get-in” listed price aka the minimum price to see the event. Granted, some of these other live events are further away than Overwatch League Grand Finals: which takes place July 26th through the 28th. It’s likely that the prices of the other events will increase closer to the date. But don’t discount this completely, ticket prices have been on the rise. And this isn’t just Grand Finals hype either. Tickets to the second round of the Overwatch League playoffs, held the prior weekend in Burbank, Calif., start at $55—more than it will cost to see rapper Logic perform at the nearby L.A. Forum on the same night. All of this bodes well for the future of Overwatch League, which recently got a deal with Disney, ESPN, and ABC. Keep in mind, however, none of this compares to the ticket sale success of Phil Collins. So while esports seems like it’s on the rise, remember: you can’t hurry love.